Oh Hollywood, What Did You Do To Dragonball?! Manga Dragonball has been adapted into anime and countless video games no problem. Turning it into a Hollywood movie seems to pose more of a problem, though. It's not easy! 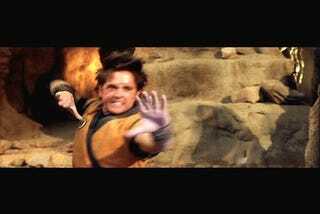 Early images of the movie, which stars Justin Chatwin from War of the Worlds and Hong Kong superstar Chow Yun-Fat, didn't exactly set the world afire. While the filmed-in-Mexico Hollywood flick has been repeatedly delayed, there have already been talks about doing a sequel. Anyway, what's reported to be images from the movie trailer below. No surprises here, really. Well, save for that albino vampire Piccolo thing. Maybe the actual trailer is better. But probably not.